An integral part of Royal Media Partners' integrated media program, our Port Shopping Guides live and work aboard ships in Royal Caribbean International and Celebrity Cruises fleets sailing Europe, the Caribbean, Bahamas, Mexico, Central America, and Alaska. The Port Shopping Guides serve as brand ambassadors for Royal Media Partners, the cruise lines, and our brand and retail partners. 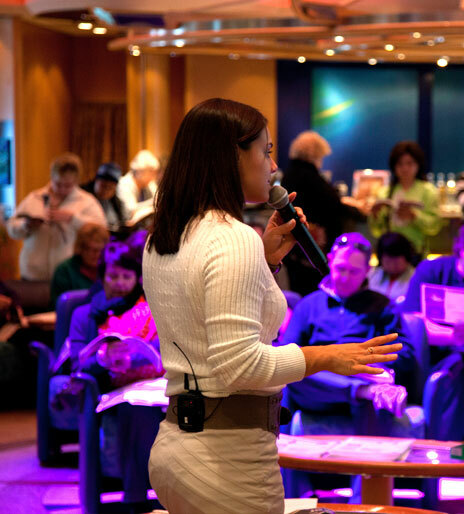 The ideal Port Shopping Guide candidate is a highly motivated, ethical, sales-driven individual who is comfortable with public speaking and ready to embark on a challenging and potentially lucrative career adventure. Key attributes include sales experience, presentation and interpersonal marketing skills, organization, focus, and dedication. Previous shipboard experience not required. Bilingual skills are a plus. Video Auditions. For more information on video requirements, click here. There is no agreement between any company and me that would in any way restrict my ability to work for Royal Media Partners. There is no written agreement in effect concerning any company that I have worked for at any point. Attached is a copy of the written agreement in effect concerning a company that may affect my ability to work for Royal Media Partners. Applications should be submitted via email to Royal Media Partners Human Resources at jobs@royalmp.com. Please include "Port Shopping Guide Applicant" in the subject line of the email. Couples who are interested in becoming a Sales Team are invited to submit joint applications and videos. Multilingual candidates are encouraged to apply. If you speak more than one language, make sure to include that information in your résumé/cover letter and indicate whether you are fluent or conversational. Following Royal Media Partners' review of résumés and video submissions, we will contact candidates for phone/video interviews. Select candidates will be selected to attend a training session in Miami Beach or on a cruise ship. If you are selected to join Royal Media Partners' Port Shopping team, you will be placed on a ship in the Royal Caribbean International and Celebrity Cruises fleets sailing in the Caribbean and/or Alaska. Scripted: Please download the sample script here. Deliver the scripted material to camera, demonstrating ease and comfort. The video should showcase how well the candidate can learn and deliver new material with confidence, compelling cadence, and genuine salesmanship. Unscripted: Deliver a two- to five-minute talk on any subject. The subject can be anything from a favorite vacation spot to a recap of a recent sporting event. The video should showcase the candidate's ability to articulate—and effectively sell—the viewer on whatever topic he or she chooses for the unscripted video. Multilingual candidates are encouraged to submit a third video on the subject of their choice in the language(s) indicated on their résumé. Our team will not be judging the videos on production quality; they will be focused on the delivery of the material. Due to file size, video auditions should be submitted via YouTube. Please set videos to "private" and grant access to jobs@royalmp.com. Include the links to the videos in your cover letter and email submission.